Occasional light rain. Thunder possible. High 52F. Winds NNW at 15 to 25 mph. Chance of rain 70%.. Some clouds this evening will give way to mainly clear skies overnight. Low 38F. Winds N at 10 to 20 mph. 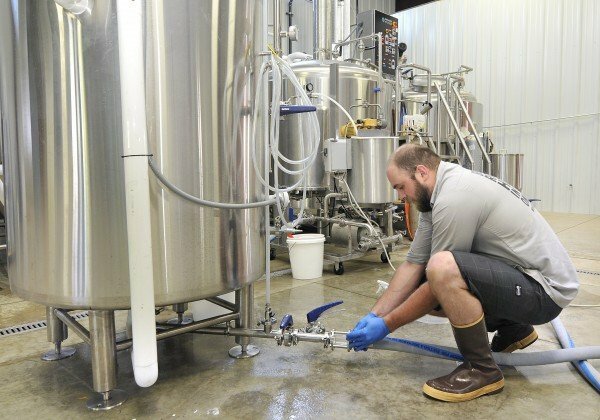 Head brewer Karl Schmitz prepares to filter a batch of a double India pale ale at West O Beer in West Okoboji, Iowa, in June. The brewery is one of the newest in Iowa. Co-owner Matt Matthiesen pours a pint of smoked red ale at West O Beer in West Okoboji, Iowa. Matt Matthiesen pours a pint of pilsner at West O Beer in West Okoboji, Iowa. Matthiesen and his wife, Michaela Matthiesen, opened the brewery in May. The West O Beer Co. taproom is shown during the brewery's opening in West Okoboji, Iowa, in May. The brewery was the second to open in the Iowa Great Lakes resort region. The West O Beer brewery is shown in West Okoboji, Iowa. Brewer Eric DeKeyzer is shown in the taproom at Okoboji Brewing Company in Spirit Lake, Iowa. WEST OKOBOJI, Iowa | The proliferation of craft breweries in Iowa has reached the Iowa Great Lakes resort region, providing vacationers and locals alike with locally-crafted beer options. West O Beer Company in West Okoboji, Iowa, joins Okoboji Brewing Company in Spirit Lake, as sources of suds for parched lake-goers. West O Beer, Iowa's newest brewery, opened May 25 in a new building at 503 Terrace Ave., adjacent to West Okoboji's city hall. The opening culminated a five-year dream for owners Matt and Michaela Matthieson, who were both avid homebrewers. "We started on the business plan about five years ago and were 90 percent done with the plan two years ago," Matt Matthiesen said. Raising funds for the brewery then began in earnest with construction of the 15-bbl brewery starting in September 2012. West O Beer head brewer Karl Schmitz brews Das O Hefeweizen, a pale ale, a smoked red ale and a pilsner that are sold by the pint in the brewery's tap room and at a few bars in the Lakes area. Seasonals and one-off beers, such as a double IPA that was being filtered recently, are planned. The brewery sells growlers - 64-ounce containers of beer - to go. Wider distribution of their beer and the installation a bottling line are in the works, Matthiesen said. West O Beer doesn't sell food in its taproom, but guests are allowed to bring in food from outside restaurants. Okoboji Brewing Company, located about about 6 miles north of West O Beer, has been selling beer since January 2012 and has been brewing at its facility at 3705 US Highway 71 in Spirit Lake since November 2012. 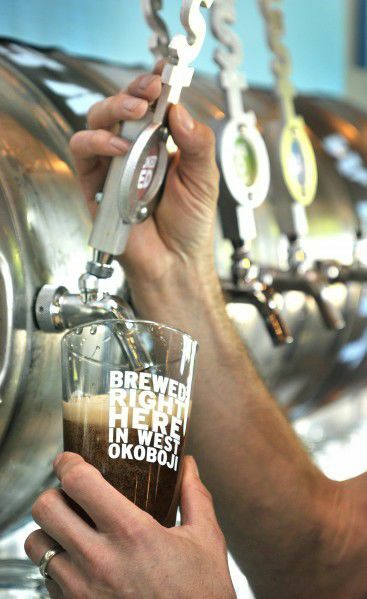 Okoboji Brewing Company's beers were previously contract brewed by Great River Brewery in Davenport while their 25-bbl Spirit Lake brewery was being built. In addition to seasonal offerings that include an annual University of Okoboji Winter Games beer, brewer Eric DeKeyzer makes Boji Beach Golden Rye Ale, Boji Blue pale ale and Midwest Charm farmhouse ale. Their beers are sold on draft and in 16-oz cans in Iowa, Nebraska and South Dakota. Pints and growlers of beer are sold in the brewery's tap room. Supplies for home brewers are also sold at the brewery's taproom. Hours: 10 a.m. to 5 p.m. Monday and Tuesday, 10 a.m. to 8 p.m. Wednesday and Thursday, 10 a.m. to 10 p.m. Friday and Saturday, noon to 6 p.m. Sunday. Submit your local favorites to the Siouxland Choice Awards!